The tomatoes here at Common Ground are as big as softballs and we’re scrambling to use them all before the Autumn cold sets in. I’ve been making different variations of this sauce over the past few weeks and it blows store-bought marinara out of the water! Feel free to dress it up with a 1/4 cup of heavy cream, roasted hot chilies for a spicy Fra Diavolo twist, or throw it in a blender with some broth and milk for a simple tomato soup! 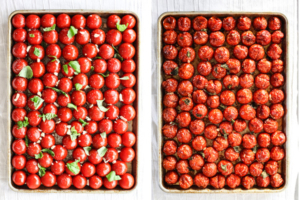 Drizzle olive oil on a baking sheet with a raised 1-inch lip, place the tomatoes on the pan in one layer. Add the garlic cloves and/or chili peppers. Use your fingers to mix well to coat. Top with kosher salt and freshly ground black pepper. 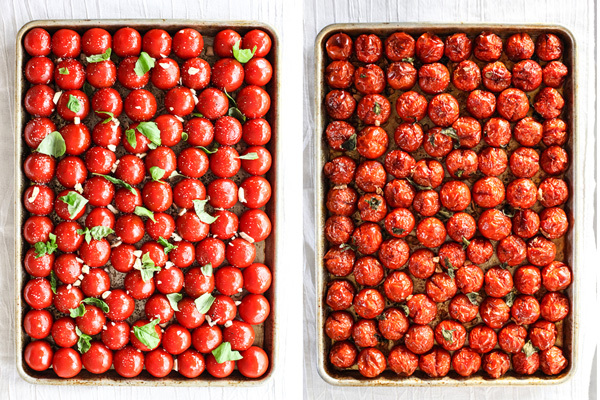 Bake for 1 hour or until tomatoes are soft and bursting. Allow to cool then pour into a blender/food processor in batches, add basil leaves and oregano, add heavy cream for a pink sauce. Pulse 2-3 times then blend for 1 minute or until desired chunkiness. Pour into quart jars or pour into freezer bags to freeze flat. To make soup put the puree back into the pot and heat on medium with either a cup of milk or cup of broth, serve with your favorite grilled cheese! Will keep in the refrigerator for 1 week or 4 months in the freezer.